Saint Ambrose, Bishop and Doctor – My Catholic Life! 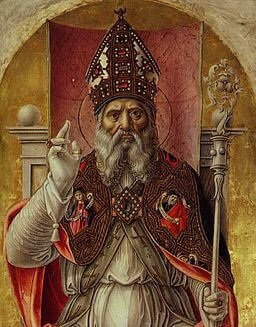 If the noble Saint Ambrose had brought Saint Augustine into the Church and done nothing else besides, he would have done enough. Augustine’s conversion was a slow boil. He was ripe for baptism when providence placed him and Monica in Ambrose’s inner orbit of friends. In baptising Augustine, Ambrose harvested what the Holy Spirit had long cultivated. But Ambrose could be a mentor only because he had previously lived his own Christian drama, and because he was supremely prepared for leadership. Ambrose was a high-born Roman, educated in the refined classical tradition of his age. He is perfectly emblematic of so many scholar bishops of the fourth and fifth centuries who saw Rome’s slow fade and the subsequent Christian dawn. Christ first rose like the sun over Rome’s ruined pagan temples in Ambrose’s own lifetime. Ambrose’s father was the governor of Gaul, and the family well connected to fellow elites. Ambrose studied Latin, Greek, rhetoric, law, and the classics in Rome. He was a patrician but also a Christian, albeit unbaptized. At a young age he was noticed by powerful mentors who recommended him for crucial civil posts, and when only thirty years old Ambrose was appointed governor of two northern Italian provinces. He was living in Milan, where the capital had migrated from Rome decades before, when his great moment came. And it is in Milan where Saint Ambrose is especially revered today. In 374 the Arian bishop of Milan died, leading to conflicts over whether his successor would be an Arian or an orthodox Catholic. Ambrose was a well-known and well-liked political figure who hovered in the Emperor’s court, so he was sent to pacify the crowds in the church where the contentious episcopal election was to occur. When he spoke to the faithful about the need for a peaceful election, they called out “Ambrose for bishop.” He was stunned, refused the honor, and went into hiding. He eventually ceded to the demands of the region’s bishops and the Emperor and accepted the position. Ambrose was baptized, ordained into Holy Orders, and consecrated Bishop of Milan, where he would spend the rest of his days. Ambrose’s asceticism and generosity increased his popularity. Augustine wrote that “great personages held him in honor.” This Adioswidespread esteem gave Ambrose a powerful voice with the emperor, whom he famously called to repentance after Roman soldiers committed a wanton massacre in Thessalonica. He also convinced the emperor, in lofty, elegant terms, to forswear support for pagan altars. Saint Ambrose came late to the study of theology but his scholarly training enabled him to master it quickly. He wrote works deftly refuting Arianism, others expounding on the true nature of Christ and the Holy Spirit, and still others on the Sacraments, virginity, ethics, Sacred Scripture, penance, and the duties of the clergy. Although not as original a thinker as Augustine or Basil, Ambrose was the very model of an educated, teaching, preaching, active, governing bishop with a pastoral heart. In his Confessions, Augustine relates how he asked Ambrose about Rome’s and Milan’s different days of fasting. Ambrose responded “When I am at Rome, I fast on a Saturday; when I am at Milan, I do not. Follow the custom of the church where you are.” This sage advice may be the source of the adage “When in Rome, do as the Romans.” Ambrose may also have been the first to promote antiphonal chant, in which each side of a church or choir takes turns in singing a text. After twenty-two consequential years as a bishop involved in the highest matters of Church and Empire, and while in his mid-fifties, Bishop Ambrose died in Milan, where his remains are still venerated in a church dedicated to his honor. Saint Ambrose, your education, courage, and teaching became a model for bishops for many centuries. Help all bishops to have bleeding hearts, iron wills, and razor sharp minds so that they can lead the faithful as successfully as you did.